Iran, 2009, 119 minutes, Colour. A fresh and invigorating Iranian drama, with a universal plot that is accessible to all audiences. The film opens with some speeding through a tunnel and some adolescent screaming, some letting off steam as a group of well-off families set off for a picnic and then some days away at a holiday villa. When booking complications arise, they rent a run-down house by the sea. For fifty minutes, the busy camera and quick edit cuts mean that the audience is right there in the middle of things, participating in the clean-up, the banter and chatter, the meals, dancing, charades and, it seems, the organiser's plan to matchmake: her daughter's nursery teacher, Elly, with a divorced friend visiting from Germany for ten days. These fifty minutes are so exuberant that we get to know the personalities, three husbands and wives, three children, Elly and Ahmed from Germany. 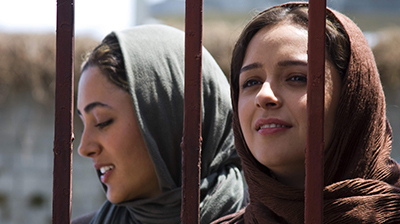 The only tension is when Elly phones her mother, who has a heart condition, and promisers her to return to Tehran. Sepide, who has organised the holiday more than we even thought tries all means to keep Elly there. It is all too good to last. There is an accident and the group does not handle the crisis at all well so that the second part of the film is tension, anger, recriminations, home truths surfacing, and bickering, fear and anxiety. When Elly's alleged brother turns up, matters become even worse. The social observation is acute, especially the roles and expectations of men and women (who plunge into the sea search, scarves and all). But the focus of the story is truth and lies, initially not giving total information but then the consequences when disasters occur, lies leading to entanglements and cover-ups and the final need to tell the truth. Well worthwhile. 1.The title, the focus on Elly, the information about her, insight into her, about the others? 2.An Iranian film, contemporary, Iranian society, wealth, the families, the roles of women and men, children? 3.Themes of manipulation, planning and control, secrecy? 4.Themes of lies, their consequences, cover-up, false scenarios, the issues of society and truth? 5.The range of moods in the film: the exuberant opening, the enjoyment of the picnic, the holiday atmosphere, going to the beach, cleaning the house, the entertainment up to the accident? The accident and the puzzle, concern, emotions, lies and tangles? 6.The car and the initial screaming, the adults being uninhibited, the picnic and the enjoyment, Elly’s role? 7.The issue of the villa and the booking, Sepide and her arrangements, concealing what she had done, getting the beach house, everybody settling in, cleaning up, joyful, the music and the dancing? The work of the parents? The children playing? The chatter and the banter? 8.The meals, entertainment, the focus on the charades and everybody participating? 9.Sepide and Amir, their family, their daughter, Elly as the nursery teacher, the friendship with the family? Amir and his age, severity with Sepide? 10.Peyman and Shaohreh and their children, the children playing, discipline, the children going into the sea, obeying or not? 11.Nasi and her husband? Their friendship with the group? Not having children? 12.Ahmad, his Iranian background, in Germany, marrying a German, his wife leaving him, the divorce, visiting for ten days, looking for a wife, Sepide trying to help him, deciding that Elly would be a good match? In himself, a genial friend? 13.Elly, her age, pleasant, nursery teacher, her doing the work for the families, her enjoying their company, yet wanting to leave, the phone call to her mother, the various phone calls and her concealing the truth, her decision to leave, the bag and her being persuaded to stay, the calls? the children? Sepide hiding her bag? Playing with the kite, her disappearance? Whether she drowned or not? The revelation about her engagement, her fiancé, their thinking he was her brother, the phone calls and the mobile phones? Ahmad and his plan? The fact that she drowned? 14.The little girl, coming to the group playing volleyball, the change of mood, the boy in the water, their trying to rescue him, the success? The different reactions to the accident? 15.Elly and her disappearance, the search, the coast guard, contact with her mother, the phone calls, finding the bag, her brother – and his being the fiancé, the truth? 16.Her arrival, the group presuming that he was the brother, getting more information, discussions and strategies? 17.The owner of the villas, the boy, their work, the story about the newlyweds, the boy doing the messages, the owner giving the information to the fiancé? The consequences? 18.The various slips in explaining to the fiancé, the tense interactions, angers, his leaving, blurting out the truth, Amir and his reaction to Sepide? Shaohreh and the children, her wanting to go? 19.The final confrontation between Sepide and the fiancé, the truth, the final truth or not? 20.Themes of happiness, interventions, crises and truth, collapse?